I recently wrapped up a series of posts entitled "Edging Toward Enchantment." I want to circle back to that theme in light of the Pokémon Go phenomenon. First, you know you're a devoted father when you find yourself driving and walking your sons around a cemetery helping them catch ghost Pokémon. That's what I did yesterday. 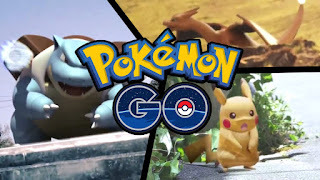 If you don't know, Pokémon Go is a new app that is part massively multiplayer video game and part geocashing. Using your smartphone GPS, Pokémon Go lays on top of your world, wherever you are, another sort of world, a world where you are a Pokémon trainer who captures Pokémon, little fantasy creatures from the Pokémon world, in the wild. What's fascinating about the Pokémon Go app is that it superimposes a world on top of the "real world." As you play Pokémon Go you are walking through two worlds. In one world you see a church, a Taco Bell or a cemetery. But in the Pokémon Go world, viewed on the app, you see a Pokémon Stop or Pokémon Gym. Two worlds, one on top of the other. You live in both, simultaneously. The theological resonances here are huge. For example, going back to my edging toward enchantment posts, Pokémon Go enchants the world. When my boys and I were walking through that cemetery that cemetery was haunted and alive. That's what enchantment is, at root. Moving through the world on two different planes, seeing things, yes, but also seeing things. In short, I wonder if living a Christian life--seeing the world with kingdom eyes full of kingdom enchantments--isn't a whole lot like playing Pokémon Go.